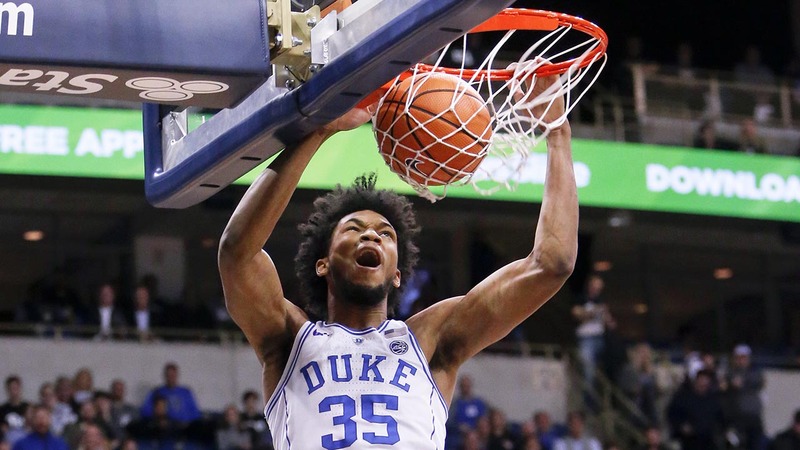 PITTSBURGH -- Marvin Bagley III scored 16 points and grabbed 15 rebounds and No. 7 Duke had little trouble bouncing back from a loss to North Carolina State by drilling overmatched Pittsburgh 87-52 on Wednesday night. Bagley also blocked a shot while recording his 13th double-double of the season, one shy of the Duke freshman record shared by Jabari Parker and Gene Banks. The Blue Devils (14-2, 2-2 Atlantic Coast Conference) never trailed and needed less than 17 minutes to build a 30-point lead. Trevon Duval and Gary Trent Jr. scored 14 apiece and Grayson Allen added 11 points, four rebounds and four assists for Duke. Four days removed from a 96-85 loss to the Wolfpack that left head coach Mike Krzyzewski fuming about his team's "frantic" play, the Blue Devils responded by shutting down the freshmen-laden Panthers. Duke limited Pitt (8-9, 0-4) to 13 points in the first 17 minutes and just 24 in the opening half, the second-fewest the Blue Devils have given up in a half this season. Jared Wilson-Frame led the Panthers with 17 points but Pitt shot just 33 percent (17 for 51) and committed 15 turnovers in all, 10 coming during a first half in which the Panthers were overwhelmed at just about every turn. The Blue Devils made their first four shots and by the time Pitt's Shamiel Stevenson hit a layup 4:05 in, the Panthers were already down eight. Bagley then responded with a dunk and hook shot and the competitive portion of the game was effectively over. A total of nine freshmen started. 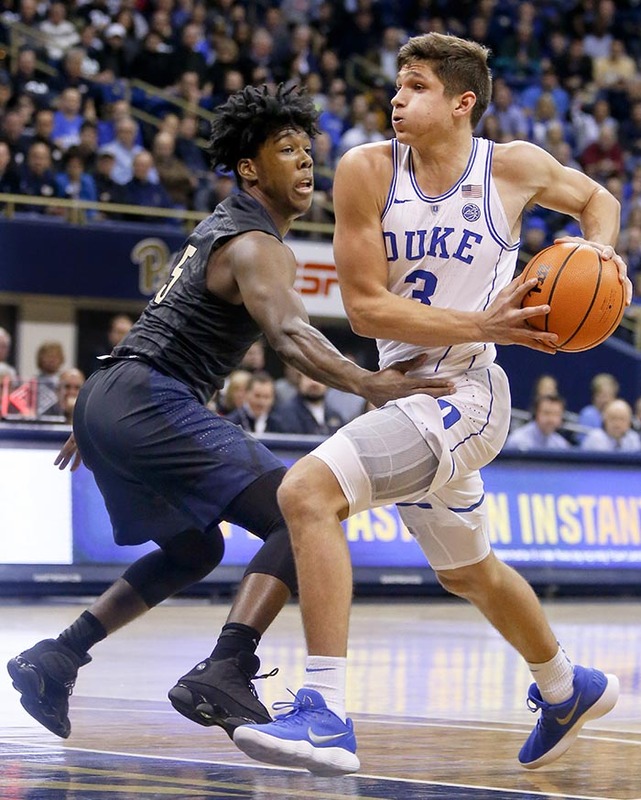 While the five first-year players who took the court for Pitt are projects that are vital to head coach Kevin Stallings' rebuilding project, the four that the Blue Devils threw out there are headed to the NBA sooner rather than later. Duke's Grayson Allen drives to the basket as Pittsburgh's Marcus Carr defends Wednesday in Pittsburgh. Bagley is at the top of the list and the 6-foot-11 center did whatever he wanted whenever he wanted against a frontcourt that is missing senior Ryan Luther, who remains out indefinitely with a stress reaction in his right foot. Duke: The blowout gave the Blue Devils a chance to get well defensively while also providing Krzyzewski an opportunity to give his thin bench plenty of run, something that could pay off down the road. No Duke player saw more than 29 minutes of action. Pitt: A long season figures to get even longer with Luther still in a walking boot and his return uncertain. If anything, it will force Pitt's young roster to grow up on the job. Down 30 less than 15 minutes into the game, the Panthers could have easily bailed. Instead they fought, cutting it to 17 in the second half and forcing Duke to call a timeout before the Blue Devils pulled away for good. Duke: hosts Wake Forest on Saturday. The Blue Devils have won each of the last six meetings with the Demon Deacons. Pitt: welcomes Georgia Tech on Saturday. The Panthers are 4-1 against the Yellow Jackets since joining the ACC in 2013.